Thierry Lehmann: Could you explain the reasons why you devote so much reflection to video games? Were you a gamer yourself? Sébastien Genvo: Indeed, I started playing video games when I was six, way before I became a researcher. I obtained a Master’s degree in Film Studies. 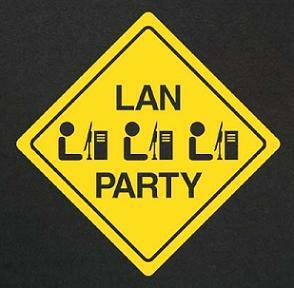 At the same time, I was in charge of a short-film festival, and Vice President of an association that organized LAN parties, events that brought together around a hundred gamers during a 24-hour period. After graduation, I applied to Ubisoft, a multinational video game manufacturer, and ended up being hired as an in-house game designer for a year and a half. Afterwards, I decided to pursue doctoral studies in Communication and Information Science at the Mediation Research Center of the Université Paul Verlaine in Metz, France. My Ph.D. centered on an intercultural approach towards game design. I sought to find a way of rallying players from different cultural backgrounds in the same game by rethinking the way messages and ideology are conveyed. What are the mechanisms of game design? What makes game design a means of expression? What are the narrative specifics of game design? Thierry Lehmann: In Médiamorphose, you wrote that “… the gaming community is central to questioning the cultural role played by the media, especially in an era where digitalization and convergence are soaring.” Could you elaborate further upon this? Sébastien Genvo: Video games have always been a fundamentally globalized media. Their success shows that those who have taken hold of the market reins are the very same ones who have grasped its inner workings. Nintendo is a fine example of this in how it conquered its target market thanks to Mario Bros. This game has a multicultural identity. Developed by a Japanese team, it is infused with Shintoism while featuring many references to Western culture: Mario is a New York-based plumber of Italian descent who climbs magical beanstalks just as Jack did in the British tale, and eats size-altering mushrooms like in Alice in Wonderland. Though but one example, it is far from being the exception for globalization is present on all levels. The other reason for this convergence is that video games fuse together several types of media, which are then reintegrated into interaction- and action-oriented logics. Gaming is often compared to motion pictures. The very first photographers or pictorialists drew inspiration from paintings to turn photography into real art. Then, when movies came about, they derived their inspiration from theater. In turn, video games looked to motion pictures to convey a message, emotions, a story, etc. Video games provide users with a structure and space in which to explore. They also pack in social interaction logic like that seen in Massively Multiplayer Online Role Playing Games (MMORPG) such as World of Warcraft, which gathers thousands of players within a single game. Gaming enables us to delve deeper into and query various contemporary media logic. Thanks to it, Internet-based social issues are addressed, challenges surrounding author and digital artist rights in the interactive media industry are brought to the table, and work is defined. In addition, its simulation media nature acts as a springboard in raising the questions likely to shed light on emerging media. For all these reasons, video games make for an interesting research topic, and I’ve been pro-actively fighting to make the greater public aware of their significance in the fields of Human and Social Sciences where they’ve long gone ignored and highly criticized. If some video games are conduits for very strong ideologies, it’s because their background is closely tied to the military making them easy targets for criticism. Hence, our goal is to put an end to the stigmatization and change our lens so that they may be viewed as a means of expression and tool for inquiry. Thierry Lehmann: Could you tell us more about the “consumption as creation” concept that has appeared on the Internet? Players take part in producing a kind of culture, or at the very least, content. Do players merely personalize the games to which they contribute, or does their input have deeper consequences? Is this type of input to be seen as the birth of co-participation or as a new kind of self-affirmation? Can these trends reshape our lifestyle, and impact real social issues? Sébastien Genvo: Gaming does involve a type of self-assertiveness and creativity. Some psychoanalysts, such as Winnicott, have explored this train of thought. Players have a natural tendency to assert their identity, and to stir up something new from it. Since the birth of this market, manufacturers have been striving to obtain feedback on improving their games, either through the creation of sequels (i.e. series games such as Mario Bros., Zelda or Doom) or compliance with dynamic logic. Dynamic logic is applied to World of Warcraft through a number of patches that modify the game and make it into something different from what it was upon first release. Designers continually keep an eye on user behavior: They take note of the rules devised by gamers, and then enhance the game with those which work well. There is a retroactive loop between manufacturers and consumers. This does not mean that consumers are all-powerful for manufacturers continue to put in-game locks on their applications protecting themselves against actions that could be detrimental to the game’s profitability or threaten market regulation. There is constant tension between the need to design creative games and the barriers that the market implements to ensure profitability. A game must first be approved by a manufacturer before publication on its platform. Though mainstream logic always has the final word, other underlying types of logic are key to pushing things in a forward direction. Player-generated content is spreading. Thanks to this free boon, manufacturers save a lot on development costs. Sony just released a game called Little Big Planet sold with the following market argument: “You’ll get to create your own world, provide your own content, and maybe even become famous by creating a level. However, a closer look at global user licenses, such as EULA (End-User License Agreements), shows that Sony owns all rights on anything users create. 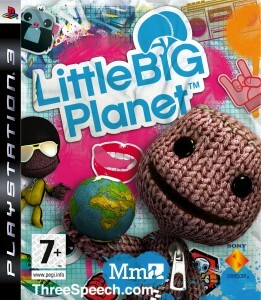 Whenever users produce content on Little Big Planet, they waive their commercial rights to Sony who can, in turn, make commercial use of the newly-created content or use it for promotional purposes without compensating players. User content is leveraged for commercial purposes. That said, things must be put into perspective. Some players take it upon themselves to make the games their own and transform them. The balance between market logic and entertainment remains a very complex and tense one. Thierry Lehmann: Today, video games appeal to all family members because they are sophisticatedly segmented offering a wide array of action, platform, serious games, etc. Development is no longer focused on graphic improvements because sufficient evolutions have been made on this front. Immersion is brought to the forefront via various kinds of interfacing, including Nintendo’s pioneering advances with its Wii Remote proposing new modalities of interaction and Microsoft’s recently launched Kinect, a remote-free gaming system based on motion recognition. 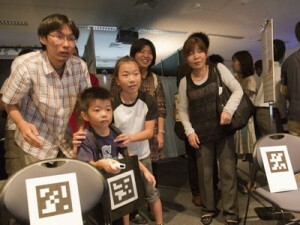 In which direction do you think video games and especially tangible interfaces are headed? Sébastien Genvo: If video games pertained only to technological exemplification as industrials had wished, the prevailing outcome would be perpetual obsolescence as was the case up until the 1990s. Digital oblivion and immediate consumption made it impossible to build a gaming legacy or even a gaming culture. Today, users contribute to constituting a video game legacy by installing emulation programs and making old games available, etc. Video game publishers have since tapped into this trend. When taking a look at video gaming’s independent scene, you discover that many games go against the flow of technological exemplification. These are, without a doubt, independent games designed by three or four people that defy market trends. You can read an article on my website about the art of game design in which I mention a game named Passage whose dimensions are roughly 12 pixels by 100. Today, an increasing number of similar games are seeing the light. This goes to show that the medium’s specificity does not solely lie in technological amplification, but in its power to convey not only emotions using a handful of visuals, but also new forms of artistic expression despite significant technical constraints, all the while banking on a more abstract realm to design new imaginary worlds. Thus, technological exemplification as imposed by manufacturers is turned upside down. Finding an old-school console with all related games is not easy unless you buy it second-hand. The market spurs players to become instant consumers. Gaming represents much more than this as video games are gradually turning into a true tool for propagating legacy. Technological exemplification is expressed not only via graphic design, but also through tangible interfaces, a new and ever-evolving industrial field in which David Arenou, who asked me to be his tutor, is an expert. I also wrote an article on this topic called “Tangible Interfaces: In Search of Utopia?” Night Driver, one of the first automobile simulators, already donned an internal vision wheel. However, since the birth of video games, the Wii Remote has become the first real successful tangible interface in this field. For instance, first-person shooting games, such as Operation Wolf, were initially played in arcades with real pistols or machine guns with force feedback. While these tangible interfaces failed to gain user approval, first-person shooting games with mouse and keyboard were all the craze. Yet, they are not quite what you’d call intuitive! What players seek, first and foremost, is rule-enforced efficiency. Players will not immerse themselves in an interface because it resembles reality, but because they master the rules of the game. If players fail to reach their objectives, the graphics will take over for a while, but their interest will, ultimately, be short-lived. On the other hand, if the tangible interface is integrated into the gaming system, its chances of survival increase. 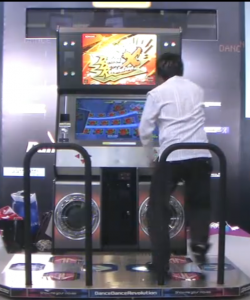 For example, in Dance Dance Revolution, the mere mimicking of steps won’t get you to the next level. Players are eager to take to new rules in a new world, and not necessarily to one that feigns their own daily routine as most interfaces usually did. The main challenge with tangible interfaces is developing tools that are effective in the gaming world without imitating realistic behaviors. The first journalistic feedback about Sony and Microsoft interfaces leaves little to be desired. People quickly lose interest. When playing tennis on the Wii, it does not take long to realize that a simple backhand movement is more than enough to engage in the game and not copying the tennis player’s exact gesture. Mimicry is no longer sufficient, which is why we should favor, instead, what I call “playability.” It is this factor that makes a video game what it is today. The art of video expression lies not only in technological amplification, but in the quality of the interaction. Thierry Lehmann: What do you think of David Arenou’s concept, IRS? Sébastien Genvo: Over the course of our talks, I had emphasized to him the need to place the interface at the heart of the game so as to satisfy the player’s objectives without mimicking reality. And David heeded my advice. If an interface can be replaced with a mouse or a keyboard, then it is not indispensable. For instance, you cannot play Dance Dance Revolution without the interactive dance platform; otherwise, the game would lose all interest. However, should you play Doom using a keyboard and mouse, the game will be even more enjoyable than with a gun. 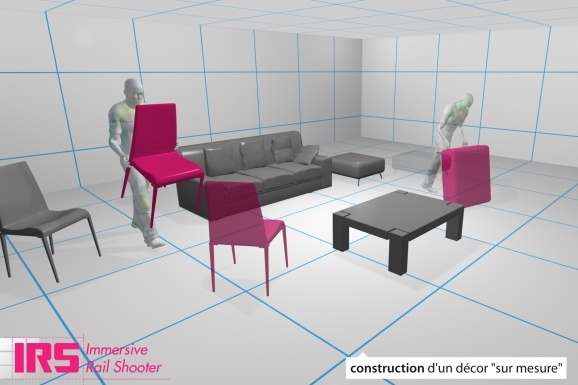 Here’s the real question: What is the true identity of the tangible interface within a project, and what makes it into a mechanism of the game?” I think David Arenou had this pretty well under control. He understood that to make an interesting game, he had to pay particular attention to the player’s movements in response to everyday surroundings not as objects, but as toys. He invested much thought on the role that immersion plays in a game, and as such, I warned him that if his plan targeted only a technological demo level, it was likely to fall short. Indeed, a tangible interface must be viewed as essential to the whole system. On another note, I was pleased to see that theory could blend in with practice and design issues. After all, the article I had written on tangible interfaces was fundamental research whose aim was to trace a retrospective opinion on the history of video games based on the success and failure of certain interfaces. But I had never imagined it within the scope of design. I want my research to encompass more than just design requirements because this enables me to address social and cultural issues, and raise long-term questions while more accurately measuring my research’s potential impact. I am happy to see my research efforts echo throughout David’s project, and all the more so given the recognition that his project has received. Thierry Lehmann: This project is not centered on technological performance, but rather on usage. Sébastien Genvo: Exactly. The relevance of a game should not be based on technological performance, as currently exhibited by Sony and Microsoft as they boast applications equipped with more sensors than the Wii and the use of three-dimensional motion in their games, but rather in terms of playability. The arguments are convincing, but so are the chances of ultimately obsolete programs. Thierry Lehmann: Beyond mere esthetics, how can design contribute to the gaming community? Sébastien Genvo: When video games first came to life, the term, game design (design applied to video games), was inexistent. Most of the time, programmers designed games, but were not allowed to take credit for them. They were not viewed as creative professionals. The value add of design on a purely esthetic level was quickly identified, but it took a while before design became recognized as a usage-oriented discipline. This sparked much controversy. In one of the first books published in the 1980s on game design, Chris Crawford stated, “We don’t need programmers who know all about exemplification nor technologists, but rather creative professionals who truly ask themselves what a game should be like. What does it take to make a good one? What makes it successful?” Chris Crawford also said that “…to answer these questions, we must set up a framework for thinking and theorizing, a framework for critical thought that goes well beyond development issues.” To me, this is design’s contribution to gaming. That said, I am not downplaying the technological aspect. The two elements – design and technology – go hand-in-hand when it comes to game conception. Design leads one to reflect about the medium and the role of usage within video games. At the end of the day, we must keep in mind that the user lies at the heart of it all. 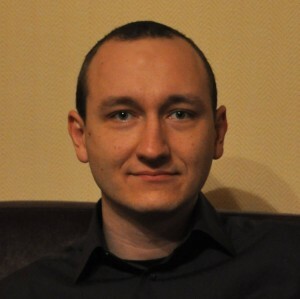 Sébastien Genvo has tenure as an Assistant Professor at Paul Verlaine University in Metz (Technology University of Thionville – Yutz) and is a member of the Research Center on mediations. A former game designer, he wrote several works about video games, and has focused his research on the economic, cultural ans aesthetic issues raised by this medium. He recently published Le jeu à son ère numérique. Comprendre et analyser les jeux vidéo at éditions L’Harmattan (Video Gaming and the Digital Era. Understanding and Analyzing Video Games) and was co-editor of Les jeux vidéo, au croisement du social, de l’art et de la culture published in the periodical Questions de communication, série actes 8, Presses Universitaires de Nancy (Video Games, at the Crossroads between Social Issues, Art and Culture).